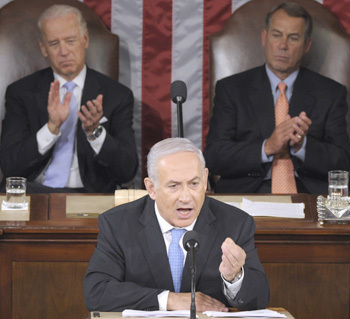 Yes, Benjamin Netanyahu is coming to address Congress – the entire event having been arranged behind the President Obama’s back. His goal: Sabotaging the peace talks now going on that could prevent war between the US and Iran. Netanyahu does indeed have more influence on the vital question of war and peace than you do – but that’s only because Americans stay silent while the War Party loudly makes its case. The Washington politicians, the bought-and-paid-for pundits, the war-mongernig think tanks – they all have an interest in maintaining your silence. You don’t have to get up on a soapbox, or plunge into activism – but how about ensuring that the online voice of peace isn’t silenced? Donate to Antiwar.com – the most visited antiwar site on the Internet. We’ve been fighting the War Party since 1995, but we can’t do it without you. Help us reach the millions of Americans who oppose attacking Iran. Help us mobilize the American people against the foreign lobbyists who pine for war.